Assemble your supplies. I used an old plate as my work surface, a paper napkin as my palette, and chose two small craft paint brushes: a medium ovalish flat brush and a standard round brush. I put a dollop of metallic gold craft paint onto my paper napkin. 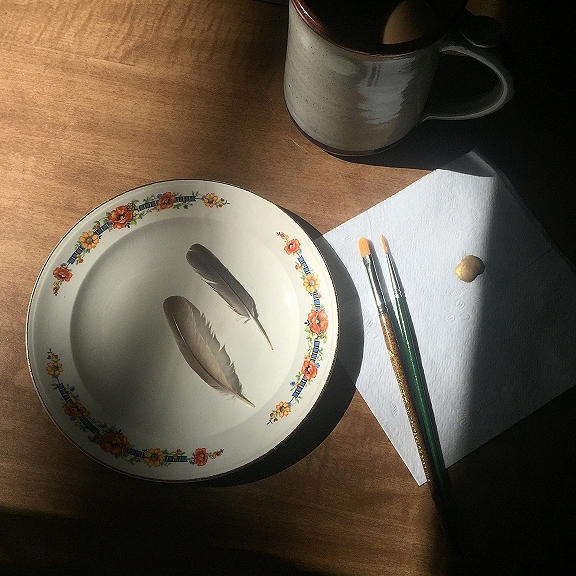 I chose two feathers to paint; one small and gray and one a bit larger and tan. The first thing I did was gently use my fingers to smooth the vanes of the feather so that they laid flat and neat. You do this by working from the center rachis of the feather and smooth the vanes outward. The bottom part of the rachis on a feather is called the quill. 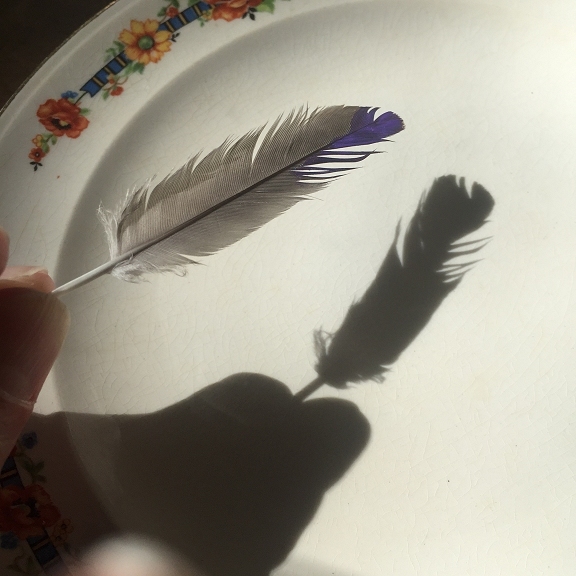 The vanes of the feather that are directly above the quill are downy. I love metallic paint! 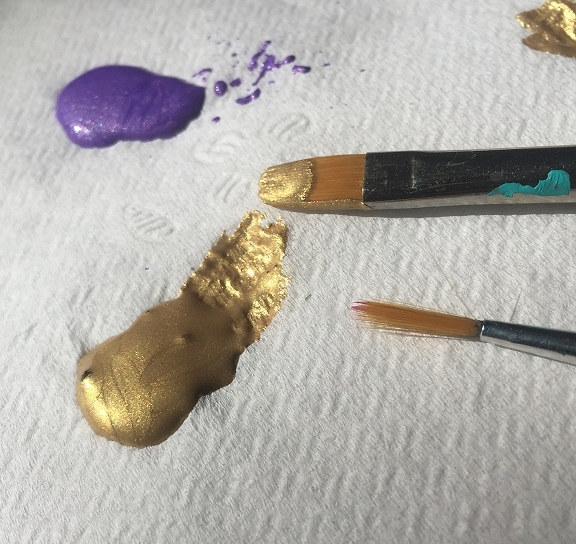 I used what I had at home; gold and purple acrylic craft paint. Yes, this is the type of paint that is about 99¢ a bottle. The first feather I painted was the smaller gray one. It was not as firm as the tan feather so I thought I might have trouble painting it. I was right. 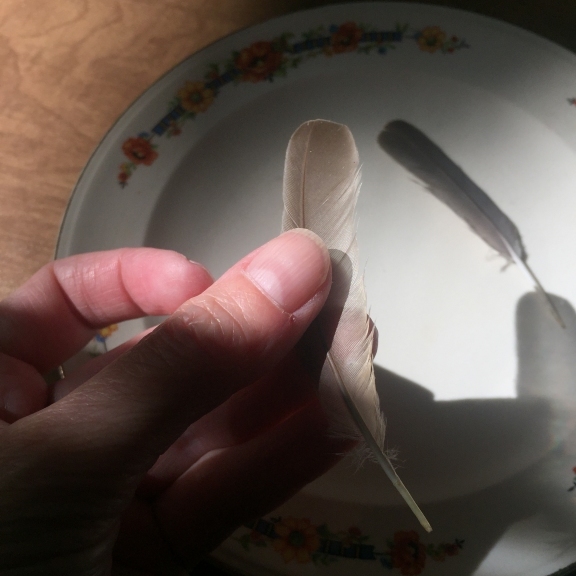 This feather was too soft and downy-like and did not hold it's shape well, so when I painted it, the vanes immediately shrunk, separated, and stuck together. Note: I am holding the feather up in the photo but I painted it by holding it flat against the plate and I used a very small amount of paint and a very delicate touch when I painted it...still, it separated and did not hold the paint well. I also tried both paint brushes and found that the flat brush worked much better for this job than the round brush. I kind of expected that but thought I would try both brushes anyway. Next I painted the tan feather. 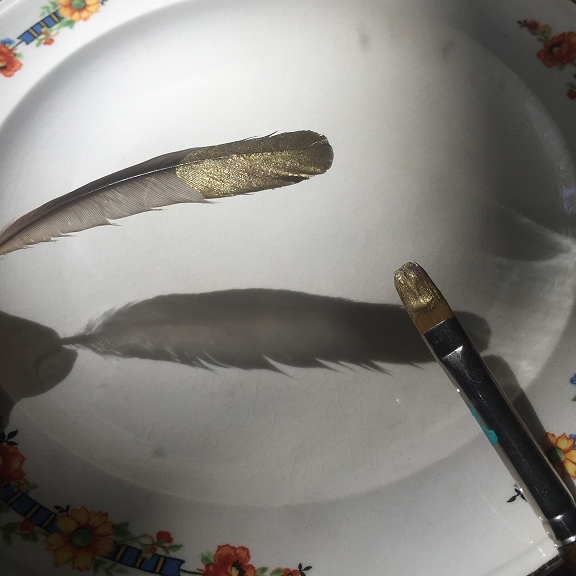 Again I used my finger to hold the feather flat against the plate and with my other hand I applied a thin coat of a very small amount of paint to the end of the feather using my flat brush. I painted from the rachis out to the tips of the vanes. I held the feather in place on the plate for about a minute before I lifted it from the plate. I was pleased to find that the feather held its shape and the paint looked great. Once the paint on the feather dries, you can apply another coat if you like, just be sure to use a very small amount of paint and apply it in a very thin coat! 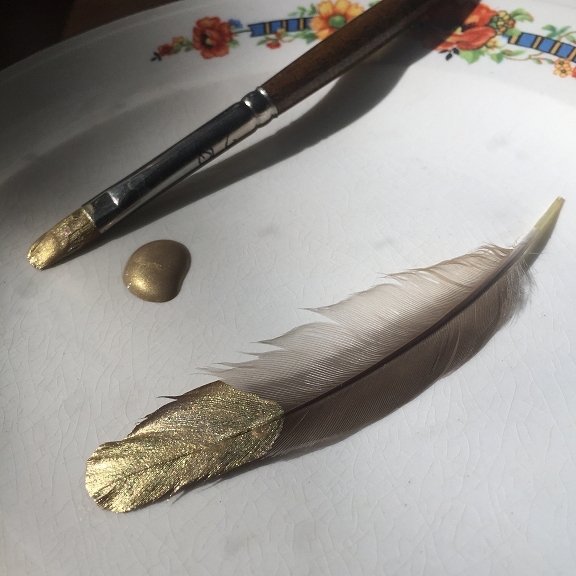 I really like the gold-tipped look because it shows the contrast to the natural feather, but you can paint as much of the feather as you like. 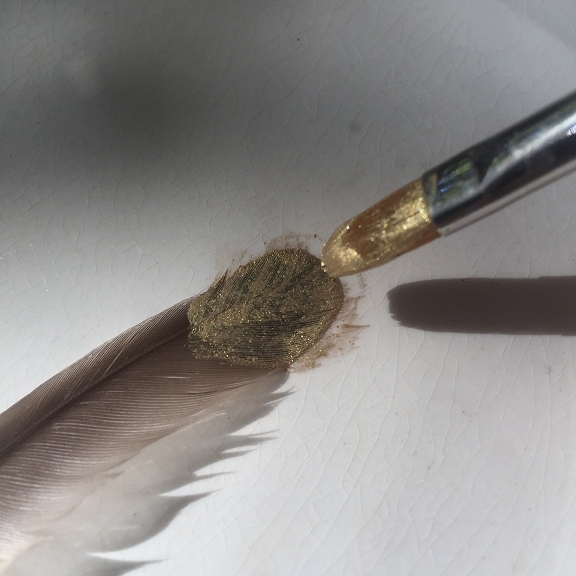 You can also paint the reverse side of your feather once it is completely dry. All in all, this project cost me absolutely nothing. 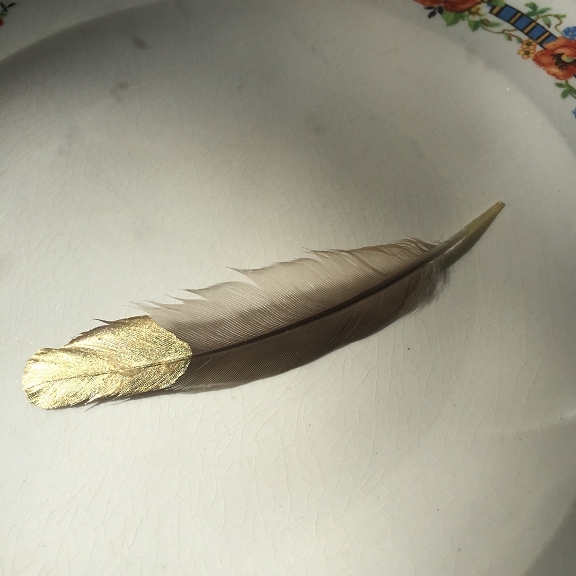 I had the paint and brushes at home, and I found the feathers in my backyard. If you were going to buy supplies, it would at most cost you $5, and that's for the paint and one good brush - and you would have enough paint to paint feathers for the rest of your life! Wouldn't this feather be pretty in an autumn wedding bouquet or added to an autumn door wreath? I hope you enjoyed this tutorial, please leave a comment below!